Most of you know by now that aside from this lovely blog that I'm an insurance agent. You're probably thinking...how boring. It's really not, though! Helping others with their insurance needs is wonderful, especially since a lot of people my age don't understand the importance of it. It's my job to help them understand, and to get them covered. Having kids is one of the greatest joys in life that's full of celebrations and surprises but sometimes, those surprises aren’t always happy. Of course, all parents work hard to keep their children safe, but unfortunately, life happens! According to the United States Centers for Disease Control and Prevention, parents spend an estimated $11.5 billion annually on injuries to children. Parents who are aware of the safety risks and insurance implications of raising kids are in a better position to reduce injuries, save money, and save lives. By making smart insurance decisions early, new parents can “childproof” their finances BEFORE the unpredictable happens. Childproofing My Finances — What Should I Consider? -If you’re expecting, it’s important to know how your health plan covers screenings, procedures and any unexpected costs. -If you have little kids, it helps to contact your insurer before installing backyard play gear and to consider increasing your liability coverage should someone get hurt on your property. -If your kids are approaching driving age, consider the make and model of your family car (or their new one!) and discuss options for lower premiums and optimal vehicle safety. Whether you are raising young kiddos, pregnant or thinking about having kids, the new Get Ready: New Parents resource kit from Insure U can help you get smart about insurance now to avoid costly decisions later. Insure U also offers a Take Action Now checklist to help you get ready (love this!). Resource kits for other life events, such as buying a new car or changing jobs, also are available online. For more child-related information, including tips, videos, apps and games, you can visit www.insureuonline.org. Being prepared is never a bad thing, right? We recently found out we're pregnant with #2, so it would go towards something for them, I'm sure. I need a new fall bag and I've had my eye on a few at Target! I have had my eyes on some shoes from Target so this would be a perfect time for a gift card! I would spend the $50 on items we didn't get from our registry! we really need a new vacuum and a Dyson has our name on it! This would be helpful with cleaning supplies, vitamins, printer ink. Baby clothes for our 3 month old and some Halloween goodies! Essentials and Season one of Ducktales : ) I was walking through the Disney DVD section and they have a lot of those awesome cartoons on dvd now! I need some updated holiday decor and I ALWAYS check over the baby items - with two sweet girls it's fun picking up something that matches or holiday jams! fall/winter clothes for my 7 year old! I am in definite need of some fall clothing essentials and a few items for my apartment. Baby stuff! Gotta stock up for baby girl who will arrive at the first of the year! Fall clothes.. or maybe a new pair of boots! How wouldn't I spend it? Groceries or make up probably. I would love to spend the gift card on all the adorable fall clothes and shoes Target has to offer! I would spend the $50 on new workout clothes!!! Target has the best sports bras! Thanks for the great tips! 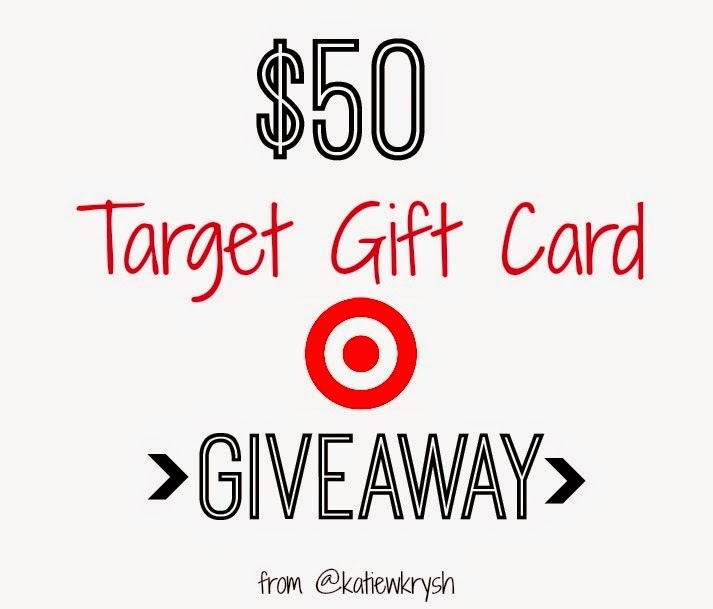 We would love to use a Target giftcard on baby gear for the little lady on the way! I can always find something to buy at Target! There is a boxwood wreath at Target that I have been DYING to pull the trigger on. This would be the perfect excuse!! This stuff is SO important. The one thing we havent done yet and we need to ASAP, is get life insurance. Its on my list! I will buy new fall clothes WHEN I win this gift card! It's not too hard to spend $50 in Target...ha! But I'm sure I would find something fun for our home, or something cute for Fall. Good post! I would have never thought to increase my coverage when installing a swing set or play house in our yard, but it make sense. My husband and I are hoping to start a family soon - I can think of a million cute Target things for baby!! I'll use it to get Halloween candy. We still have a few things we need before baby boy makes his arrival in 2 months! It isn't hard to drop $50 at Target with everything they have!! I would use the gift card on some diapers and things we need for baby # 2! use it towards some gifts for my new baby niece! Thank you for the great info! I have been wondering....I looked into adding our baby (Due in December) to my health insurance plan once she gets here and the monthly cost is just completely unaffordable. Are there other options for coverage for our baby? Thanks! I hope you are still enjoying your pregnancy! If I had a $50 gift card right this second I'd go crazy with the Buy 1 Get 1 50% on all boots I just got emailed! I would buy some things for my classroom! I would buy some diapers. We are moving on Friday and I would spend the $50 on home decorations from the Threshold collection. On some new fall clothes! I would use the gift card on some new fall clothes!! The Sally Gel Nail Kit! School uniforms. My boys are growing like weeds out of their uniforms from the thrift store. New ones would be a treat! Training for a 5 k and realizing i need some cute running clothes! My addiction......baby clothes for my mini's! This is a great giveaway! I would buy Nail polish and fun items for my Scottsdale trip next month! With the third little boy on the way, I'd use it to buy fun, new things for the baby! Even little ones get tired of hand-me-downs! I'd put it towards the ice skating team jacket my daughter wants. I would put it toward new bedding! I would buy some new shoes for the upcoming wedding I'm going to in a couple weeks! I'd probably spend it on my grandsons and buy them each a new jacket to wear this winter! I would buy workout clothes. I would buy myself maternity clothes! I would use the gift card to buy health and beauty. I would use it for Christmas shopping. I would buy jackets for my kids. I'd buy craft supplies for Christmas gifts - thank you. I'd spend it on groceries. I would love to go Christmas shopping for kids in need. I Would Spend It On Holiday Gifts. My daughters b-day is coming up so I would get her some things. I would spend it on maternity clothes! I would buy a Christmas gift for one of my five grandchildren. I would buy a new outfit for my daughter! I would buy a new purse. I would buy new clothes!